We have been using d3js to visualize things on maps. And after struggling with topojson application my boss found a way to convert Sri Lanka Shape file (.shp) to topojson format. Then we wanted to use cartograms for our visualizations. With the help of this blog post - http://www.limn.co.za/2013/10/making-a-cartogram/, I finished cartogram Visualization. And Nisansa's co-ordinations for center of Sri Lanka was very helpful to calibrate Sri Lanka map. 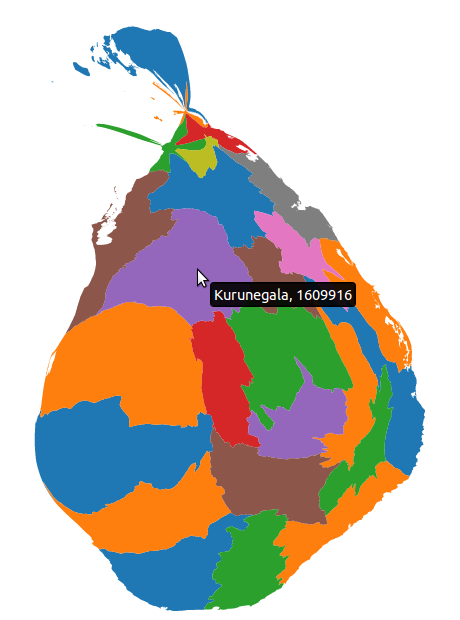 You can find my sri-lanka-cartogram repository on GitHub - https://github.com/dedunumax/sri-lanka-cartogram. Thanks https://github.com/mbostock for d3js library! He is a wizard in visualizations. Thanks a lot https://github.com/shawnbot for cartogram.js! Hope this will be useful to you. Sounds Good! Sorry I didn't get that? What is the idea I can get from this implemented map? For this demo I used Sri Lankan Population. And this is a type of maps which you can visualize different variables. Wow! This Cartogram thing is amazing. Thanks bro.